It isn’t just children with symptoms on the Autism Spectrum. Many older individuals also struggle with intellectual disability and emotional outbursts, as well as difficulty suppressing urges. Autism Spectrum Disorder (ASD) can cause lifelong challenges, and the Centers for Disease Control and Prevention (CDC) released a telling bit of data. 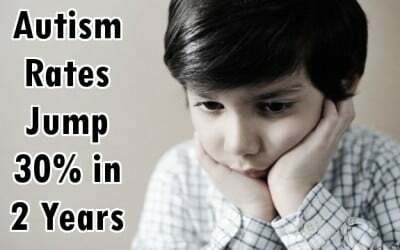 Autism rates have risen 30% in the last 2 years, with 1 in 68 children now suffering from ASD, part of the continuing, perplexing rise in the syndrome. Though the study was conducted in 2010, the CDC released Prevalence of Autism Spectrum Disorder Among Children Aged 8 Years — Autism and Developmental Disabilities Monitoring Network, 11 Sites, United States, 2010, in late March of this year. In just the past two years, the likelihood that a child will be diagnosed with ASD has increased an incredible 30%. There are numerous possible causes of autism – among them are the health of an older father’s DNA, vaccines, and of course, environmental toxins such as pesticides and herbicides, or even household chemicals that can cause a disruption in gene development. Unless, of course, individuals are exposed to an onslaught of herbicides, pesticides, and corporate chemicals including aluminum, barium, thimerosal (mercury), BPAs, etc. As chemical exposures have greatly increased, this can lead to de novo genetic mutations. These mutations arise spontaneously in the parents’ reproductive cells due to events such as random errors in DNA replication or environmental exposures that alter DNA. While we don’t know exactly what causes autism, the huge jump in cases begs for better pesticide and chemical reform. Researchers agree that environmental exposure to a number of toxins creates a ‘stew’ of gene-altering mechanisms in the body, increasing the risk of autism. Environmental exposure to chemicals can play a huge role in autism, yet most remain untested. Currently, there are more than 3000 high-production volume chemicals being used in our world today, and pregnant women are exposed to them daily. It is no wonder that autism rates are skyrocketing. Congress needs to act immediately to address the toxic dangers in our environment. An entire generation of individuals’ health is at stake. Genetic inheritance?..DNA inheritance? NOPE! The Human Genome Project, launched in 1990 turned out to be an ‘epic fail’ regards ‘genetics’. It proved, to the shock of nearly all materialists (scientists), exactly the opposite of what scientists had hoped. It proves that genes alone do NOT explain inheritance. The materialists were horrified by this finding and it sent the entire scientific community into a tailspin forcing “the great genetic cover-up” to begin- (year 2000). What they found is there isn’t enough data storage in 20,000 genes to hold a blueprint for a human being. To date, they are desperately trying to find some ‘meta data’ that would explain all inheritance. One can google ‘genetic inheritance shattered’ or ‘the big lie about genetics exposed’ and find it. The allopath pediatricians however, continue to lie to the parents of the affected by telling them their defective genes passed autism to their children, and the sheeple eat it up. On the other hand, CDC Whistleblower, William Thompson, recently reported he had participated in a major scientific fraud regards the MMR vaccine (NOT) causing autism. He and his co-authors published the study in 2004 claiming there was NO MMR connection to autism. They deliberately omitted vital data which contradicted that finding. That’s right. This is the way the ABC agencies of the GUBMINT roll. HIDE the truth from the people! However, on Feb 2, 2004, Thompson presented a letter to Julie Gerberding, HEAD of the CDC (2002-2009), telling her he would have to present several problematic results relating to statistical associations between the receipt of MMR vaccine and AUTISM. So Gerberding, the head of the CDC, knew there “were problems.” She knew Thompson was telling her there was a CAUSAL CONNECTION between the MMR vaccine and autism but she chose to line her pockets instead, on the backs of innocent children and their unsuspecting parents. Gerberding is now president of Merck Vaccines — MAKERS of the MMR vaccine. She knew since 2004 the MMR was causing autism, covered it up and allowed children to be criminally vaccinated with autism causing MMR vaccine for another 10 years (since the study), for Vaccine$ INC to continue their VACCINATION FRAUD for PROFIT$. IMO, Gerberding should be indicted, prosecuted and sent to prison and stripped of her government retirement pension because she did NOT do her job. She lined her pockets instead, on the backs of INNOCENT children. Criminal! Of course the genetics don’t change that rapidly…. Oh wait, yes they can… But they didn’t. That statement brings absolutely nothing to bear on the widened diagnostic criteria and increased awareness of ASD. If the “problem” is simply that it is diagnosed more often, what could that possibly have to do with a genetic abnormality? Is anyone claiming an increase in such abnormalities?